Personally I think this is one of Andy’s stupidest videos. It’s definitely his most daring! Here Andy actually tries to manipulate the key witnesses in his securities fraud trial on camera with promises that they will all be millionaires if they keep their fake shares. It’s unbelievable that someone facing felony charges for fraud would publicly attempt to manipulate key witnesses in the case against him and promise them money if they continued to buy into the scam. Andy begins this video by claiming that he is not the manipulator, I am. This a pretty bold claim considering he’s on trial for manipulation and I am not. 40 seconds into the video Andy brags that there’s a multi-million dollar lawsuit int he works and suggests that if the witnesses against him cooperate, they will be able to share the spoils. This is absolutely insane! First of all, Andy doesn’t have the resources to file such a lawsuit, second he has no grounds for such a lawsuit since he has no intellectual property and never filed a patent for any of his ridiculous ideas, third Andy’s only attorneys are criminal lawyers trying to keep him out of jail, and finally trying to bribe witnesses with promises that they will share in a multi-million dollar lawsuit if they play ball is criminal! At :55 Andy claims that my mother and I were hired by some unnamed masked man to discredit Andy. That’s an odd claim considering I haven’t spoken to my mother in years and I already have a job (Andy it must be noted does not). 1:05 Andy claims that he’s not angry at the Utah victims for stealing their money and that this all his rants over the last three years were simply to collect data for Steve Klemark’s mythical Digital Internet DNA project. In other words, Andy never meant to look like a nut, it was all just a setup for me. 1:25 Andy claims that he will be bringing 20 – 40 people to Utah for his criminal trial instead of the half dozen brainless minions he brought to his preliminary hearing. He then says that he’s been trying to get in touch with the ‘District Attorney’ to make arrangements to pay the Utah victims back, even though the Prosecutor told Andy that doing so would not stop the criminal case against him and he didn’t need to go through the courts to do it. 2:00 into the video, Andy begins going through his collection of Linked In connections and bragging that they imply some sort of broad media coverage and legitimacy on his part. He thinks that having a connection to a recruiter for Linked In means he’s endorsed by the company. 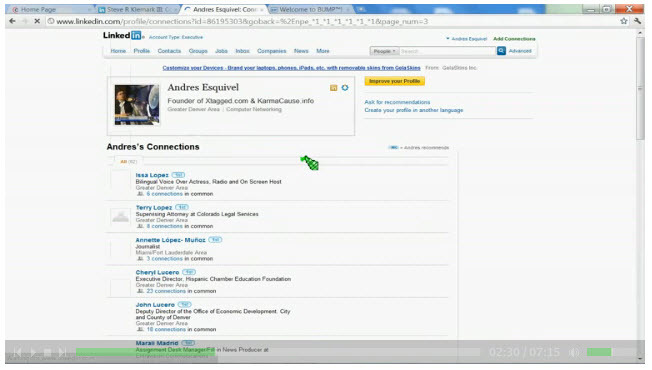 He shows a Linked In connection between Steve Klemark and the Mayor of Denver (not surprising since he’s a state employee) and uses that to ‘prove’ that Steve Klemark is more than a low-level IT guy at the Denver PD. Andy actually spends two whole minutes ranting about how a few Linked In connections proves he’s famous, which only shows how little Andy knows about social media. 4:15 into the video Andy begins ranting about how Mitch Thrower is a Billionaire (he is not) and how he found a fatal flaw in Bump.com and somehow that has something to do with Andy and Xtagged. This segment is mostly senseless babble which makes little sense, but Andy uses the fog to allude to some sort of connection to Thrower and to imply that this somehow validates Xtagged or his lawsuit or something. Now the fun part! Startign at about 5:00 in the video, Andy turns the spin up to 11. he starts by asserting one more time that he SOLD Xtagged and that if the Utah victims keep their fake percentages in a legally nonexistent company and let him keep their money, they will all become millionaires! not only that, but they’ll also be asked by mentally incapacitated stoner Allen Brady to tour the country and speak on countless college campuses telling the story of how they were manipulated by me. You have to be really high or really stupid to fall for this garbage, but Andy keeps spinning it as if it’s the gospel straight from the lord on high. He once again asserts that the last two years of senseless rants on his part were merely to smoke me out and to gather data for Steve Klemark’s mythical Digital DNA technology. Wow! At 5:45 in the video, Andy announces that he’s fired Leonard Martinez for collaborating with me. He goes on and on about Leonard giving me his “discovery,” even though the Davis County courts have NO RECORD of Leonard Martinez ever requesting discovery and the first recorded request for such didn’t occur until December 8th, long after this video was recorded, by Michael Holje! To me, this video is simply amazing! It clearly illustrates how stupid Andy Esquivel is and proves that up until this video was made he was not receiving competent legal counsel. NOBODY in their right mind who was facing felony fraud charges facing fraud charges would post a video like this on Youtube and any attorney who advised his client to do so would surely be guilty of malpractice. Aside from the signed notarized fraud documents Andy used to defraud his victims, I think this video is probably the most damning piece of evidence against him. At 6:10, Andy begins thumping his chest and claiming that the SEC (Andy has never spoken to the SEC) has promised him a federal investigation and he welcomes it. He says he’s hired a lawyer that everybody would be surprised to find out who it was. of course the lawyer turned out to be Michael Holje, a associate attorney at a law firm in Salt Lake nobody had ever heard of. This video say’s we win! Thanks Andy for being so dumb! I love showing these videos to the family we all get good laughs.